Although autumn officially arrived a few weeks ago, it was just yesterday that our Louisiana weather caught on. Like many other Southerners I know, autumn is my favorite season, which is funny seeing that we really don’t experience many signs of fall down here. Most of the leaves on our trees turn brown instead of brilliant gold, fiery orange, and deep red. I’m not sure our temperatures ever really reach the point where flannel blankets become warm rather than scratchy (though we love them nonetheless). Early morning temperatures of less than 60 degrees usually call for cable knit sweaters and fleece jackets. But maybe that’s why this season is so special to us. We cherish the small glimpses we do receive. Crisp breezes come as a relief to summer’s enduring heat. When the few trees whose leaves do turn colors finally begin to change, driving by to marvel at the beauty of transition can become a daily ritual for an entire community. Like nature, we tend to slow down to focus on family, friends, and all the things for which we are thankful. As the weather cools down, my spirit grows warmer and more welcoming. I want my home to reflect the same spirit. My family loves to use our fireplace whenever we can, so I always focus on bringing seasonal elements to our mantle. In Autumn, I like to keep them natural, so simply placing a basket of firewood on the hearth is both useful and decorative. I always buy real autumn leave from the grocery or craft store and use them to fill in around my collection of autumn gourds and pumpkins. 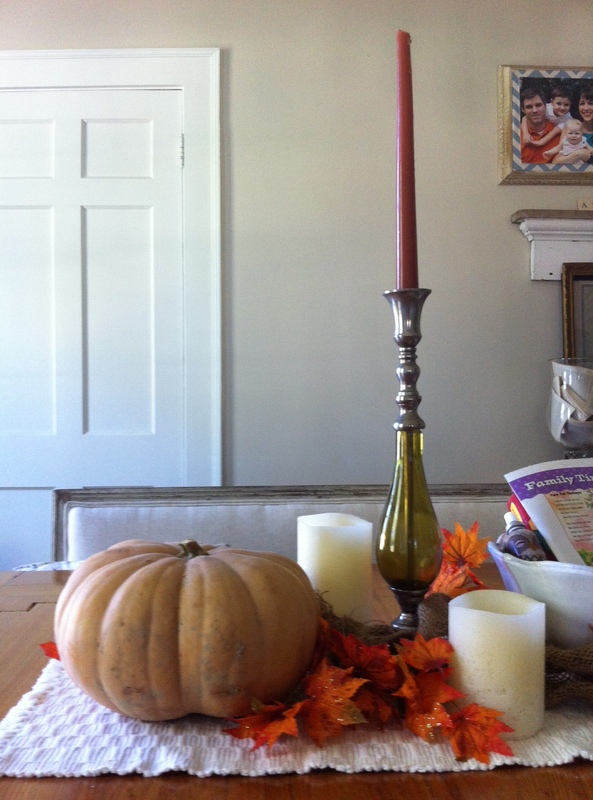 This year I chose to place real pumpkins on the table rather than the mantle. I added my vintage wood clipboard and old reading primer card – estate sale and flea market finds – just for a fun touch. 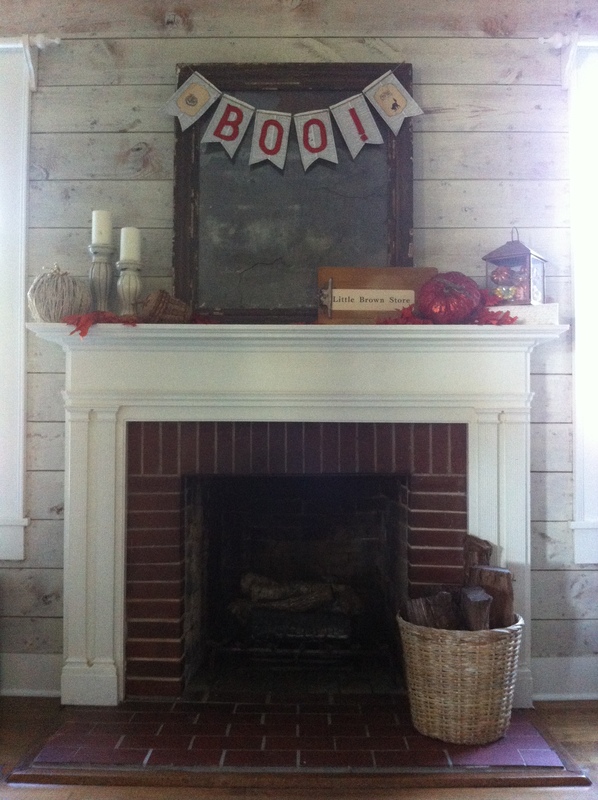 The “Boo!” banner is a recent purchase from a local crafter. It’s made entirely of up cycled materials – old book pages, twine, and an old orange sweater. I love the way it ties in several aspects of my family’s style to a fairly common mantle theme. This year, I placed my favorite funky real pumpkins on the center of our dining table surrounded them with a combination of real and artificial fall leaves. Because we use this table at least two times a day, I chose to keep the big white bowl at the center of this arrangement. It holds a weekly family time brochure that comes home from school with my eldest son, a kids devotional that we do our best to read a few mornings a week, Bath and Body Works’ Autumn room spray (my favorite), and other odds and ends such as the requisite army men, mardi gras beads, broken crayons, and anything else the kids leave lying around the dining room. 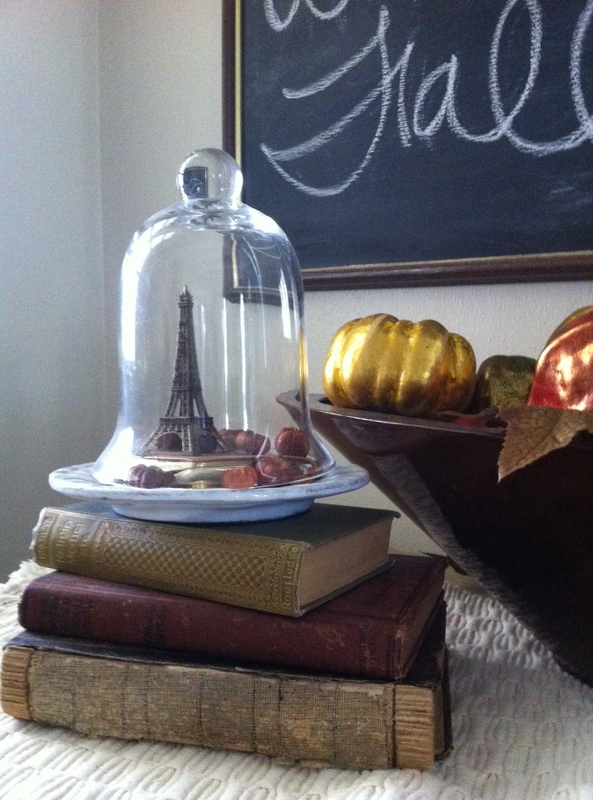 This little vignette sits on our entry table. I pulled the old books from elsewhere around the house, the plate from our cabinet, and the little Tour Eiffel is one of my most favorite (and least expensive) souvenirs from an autumn semester abroad in France. I found the globe at a thrift store for less than $3 and the small book of maps that the tower sits on was a gift from a friend in grad school. I scattered in those tiny dried pumpkins which are probably almost 10 years old and were purchased from my one of my favorite stores of all time. All these things remind me of the beauty of the season in different places that are near and dear to my heart, and they provide me the opportunity to share stories of my experiences with my boys, who I dearly hope will one day spread their wings and have their own travelling adventures. I’ve seen several photos of beautiful autumn decor in non-traditional colors such as green and white. Though tempting to try, I just can’t seem to break from the warm colors of this arrangement. Pairing traditional autumn colors with everyday household items and special mementos is how I like to create an autumn spirit in my home. 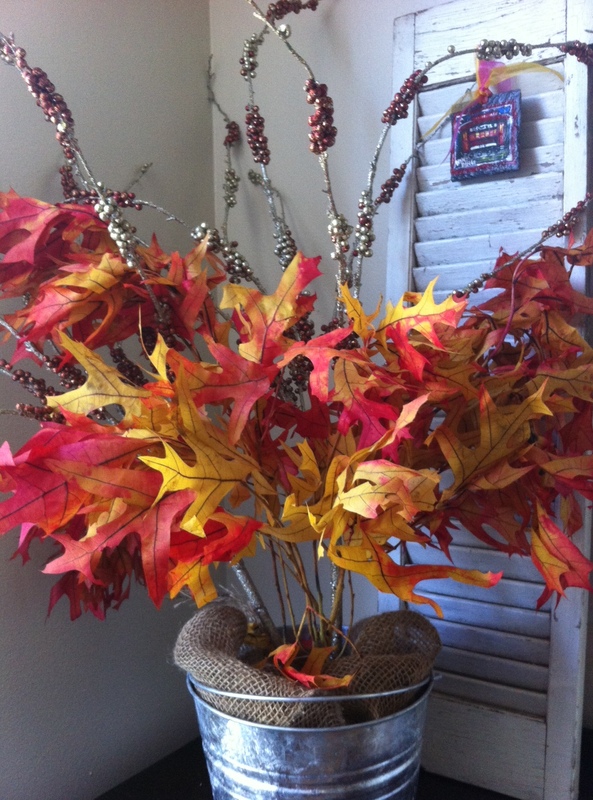 How do you bring autumn into your home? Thanks, Katie! It changes about that often! Hope to see you in person soon. I personally cannot resist buying crotons to put on the porch when autumn gets here. I know I won’t try to keep them alive till next year, and that they will go with the first frost, but they spell out the season in my mind.